TOKYO (Kyodo) -- Former Rakuten Eagles slugger Andruw Jones, Orix Buffaloes pitcher Alessandro Maestri and new Softbank Hawks hurler Rick van den Hurk have been named to a squad that will play two games against Japan in March. The trio are part of manager Steve Janssen's European team for the March 10 and 11 games at Tokyo Dome against manager Hiroki Kokubo's Samurai Japan. 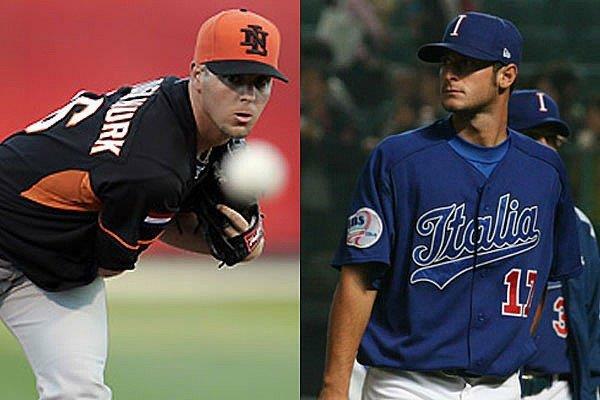 Also coming will be Netherlands ace Rob Cordemans and 2.16-meter former Rakuten reliever Loek van Mil. The squad announcement was made Tuesday by the World Baseball Softball Confederation on its website. "I have either been their coach or have coached against them in international competition, and I think our coaching staff has put together a solid roster and talented group," Janssen, who currently manages the Dutch national team, was quoted as saying by the WBSC website. "It's a huge honor and great opportunity -- and responsibility -- for our players to enter the stage wearing the Europe jersey, competing against the No. 1 ranked country in the world in their home. This is baseball...this is what it's all about." Jones, who was big part of the Eagles' 2013 Japan Series championship, was released at the end of last year. In two Pacific League seasons, the longtime major league star batted .232 with 50 home runs. Despite his low batting average, he drew 223 walks and scored 150 runs, while driving in 165. Maestri is entering his fourth season with Orix, who plucked him from the roster of independent minor league club Kagawa in 2012. The 29-year-old Italy international went 3-1 with a 1.97 earned run average last year in 36 games for the Buffaloes. The 29-year-old van den Hurk has joined Softbank this season after leading the KoreanBaseball Organization with a 3.18 ERA and 180 strikeouts for the Samsung Lions. In his major league career, van den Hurk went 8-11 over six seasons, mostly with the Florida Marlins. The WBSC has announced that the umpires will be from Taiwan's pro league. Kokubo announced his team for the series on Monday.